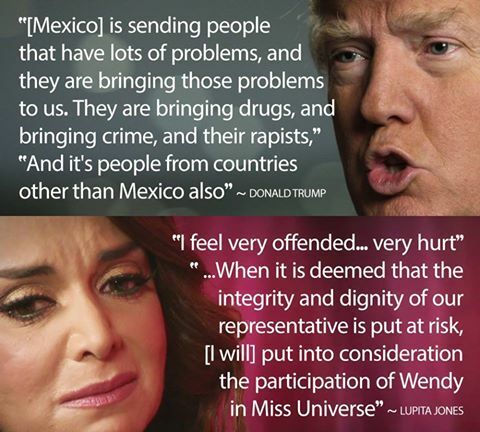 Donald Trump, Lupita Jones & DRAMA! Acts are fun when there is a good comedian/drama-king. But when you have two entertainers in an act instead of just one, expect a hell lot of drama! The same thing is happening right now! 😉 Ok we will take one entertainer at a time! Donald Trump wants to be the President of America! First we have Mr. Donald Trump! LOL! So Mr. Trump has announced his intention to contest in the American Election for President. Now we are no experts, but he is perhaps at the 12th place among those who can be candidates as Republican in the election – means his chances are dim. Americans better not pick the man because he is trying to “make America great again”, thereby acknowledging his dismay. I mean, is America not great now? Anyways, I am not an American and hence I drop my guns on this one right here. But apparently, Mr. Trump often speaks a lot about Mexico and it’s not that positive! Now turn to bring the second entertainer into the picture. Lupita Jones, the national director of Mexico and Miss Universe 1991 winner, reacted to this as mentioned in the picture above. She wrote this on her twitter! And now, we have one more statement from her. Mariana’s exclusion from Top 7 of Miss World 2012 did not go well with Lupita, who took to Twitter to express her anger. Anyway, drama is not new to Lupita Jones. After Miss World 2012, she took to Twitter and lashed out at Julia Morley! She had said that Julia Morley has blocked Mexicans from Miss World. Now the thoughts of Lupita are not baseless because the stunning Perla had to suffice with 1st runner-up post in Miss World 2009 and even in 2014, Miss Mexico deserved Top 5 spot. She as Top 5 in Beach Fashion and had impressed everyone with her presentation in Top Model. She was very beautiful facially. In fact, even in Miss Universe 2014-15, Miss Mexico was amazing in presentation show, and surprisinly missed the cut in finals.